Children should not be a number. : Some required reading. 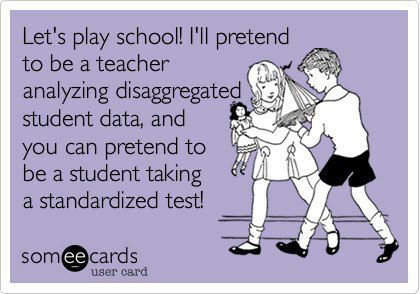 Standardized testing boycotts spreading: Momentum! News report on the cost of teacher evaluation systems in New York State. NYSED and the fear machine (Part III) - don't give in! Massachusetts professors protest high-stakes tests. What is really behind the Common Core: profit. "There's gold in them thar test prep Common Core workbooks." More on the Common Core costs and origin. This is what happens when we neglect other subjects in favor of prepping for ELA and math assessments- we force feed curriculum into math or ELA. Edy the Warrior- an opt outer from Texas.